by Edwards, George C., III, Wayne, Stephen J.
Edwards, George C., III, Wayne, Stephen J.
George C. Edwards III, one of the country's leading scholars of the presidency, is Distinguished Professor of Political Science at Texas A&M University. He also holds the George and Julia Blucher Jordan Chair in Presidential Studies in the Bush School, and has held visiting appointments at Oxford, the University of London, Peking University, Hebrew University in Jerusalem, the University of Wisconsin, and the U.S. Military Academy at West Point. He was the founder and from 1991-2001 the director of The Center for Presidential Studies. He has authored dozens of articles and has written or edited nineteen books on American politics and public policy making, including AT THE MARGINS: PRESIDENTIAL LEADERSHIP OF CONGRESS, PRESIDENTIAL APPROVAL, PRESIDENTIAL LEADERSHIP, NATIONAL SECURITY AND THE U.S. CONSTITUTION, IMPLEMENTING PUBLIC POLICY, and RESEARCHING THE PRESIDENCY. He is also editor of Presidential Studies Quarterly. Among his latest books, ON DEAF EARS: THE LIMITS OF THE BULLY PULPIT is a study of the effectiveness of presidential leadership of public opinion, and WHY THE ELECTORAL COLLEGE IS BAD FOR AMERICA advocates direct election of the president. 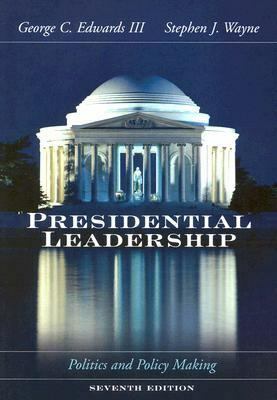 He serves on the Board of Directors of the Roper Center and the Board of Trustees of the Center for the Study of the Presidency.Edwards, George C., III is the author of 'Presidential Leadership Politics And Policy Making', published 2005 under ISBN 9780534604028 and ISBN 0534604021.